Introduction: There has been significant growth in international tourism from South-East Asia. Travel medicine services are still quite limited in this region. Few data exists on the knowledge, attitudes and practices of travelers from South-East Asia regarding the prevention of travel-related health risks. The present study aimed to characterize the travel trends and risk reduction strategies of international travelers departing from a major Malaysian airport. Methods: We conducted a cross-sectional survey among international travelers at the Kuala Lumpur International Airport. A questionnaire recorded data on the demographic profile, travel patterns, travel health protective measures, sources of pre-travel health advice, personal perception of travel-related risk, and barriers to seeking health advice, travel vaccinations and malaria chemoprophylaxis. Results: 36.8% of respondents had sought pre-travel health advice, mostly (64.7%) from their doctor. 23.6% of the travelers had received travel vaccinations. 40% of travelers were uninsured and over 50% did not know how to access medical care overseas. The survey revealed deficiencies in the risk perception of travelers regarding endemic infectious diseases such as malaria, dengue, and rabies. A minority of the travelers reported an intention to avoid unsafe food and water, inform themselves of local disease outbreaks, pack a first-aid kit, and protect themselves from animal and mosquito bites. Conclusions: This study highlights areas of concern in relation to the knowledge and behavior of the travelers surveyed and points to the need for raising public awareness in South-East Asia of the risks associated with international travel and the most efficient means of mitigating those risks. 1. United Nations World Tourism Organization (UNWTO). Tourism to-wards 20130. Available from http://www.world-tourism.org [Cited 24 December 2014]. 2. World Health Organization. WHO Vaccine Preventable Diseases Monitoring System 2012. Available from http://apps.who.int/im-munization_monitoring/en/globalsummary/countryprofileselect.cfm [Cited 24 December 2014]. 3. Travel medicine for Asian travelers – do we need new approaches? J Travel Med. 2012;19(6):335-7. 4. Hung KKC, Lin AKY, Cheng CKY, Chan EYY, Graham CA. Travel health risk perceptions and preparations among travelers at Hong Kong International Airport. J Travel Med. 2014;21(4):288-91. 5. Van Herck K, Zuckerman J, Castelli F, Van Damme P, Walker E, Steffen R. Travelers’ Knowledge, attitudes, and practices on preven-tion of infectious diseases: results from a pilot study. J Travel Med. 2003;10:75-8. 6. Van Herck K, Castelli F, Zuckerman J, Nothdurft H, Van Damme P, Dahlgren AL, et al. Knowledge, attitudes and practices in travel-re-lated infectious diseases: The European Airport Survey. J Travel Med. 2004;11:3-8. 7. Heywood AE, Watkins RE, Iamsirithaworn S, Nilvarangkul K, Maclntyre CR. A cross-sectional study of pre-travel health-seeking practices among travelers departing Sydney and Bangkok airports. BMC Public Health. 2012;12:321-9. 8. Lopez-Velez R, Bayas JM. 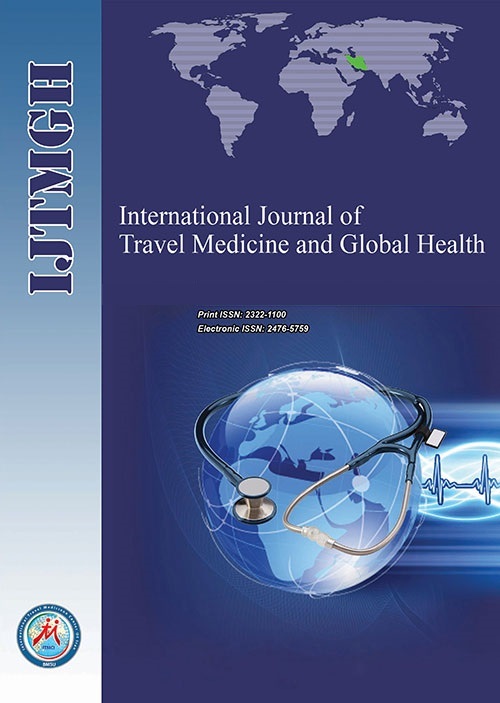 Spanish travelers to high-risk areas in the tropics: airport survey of travel health knowledge, attitudes, and prac-tices in vaccination and malaria prevention. J Travel Med. 2007;14(5):297-305. 9. Wilder-Smith A, Khairullah NS, Song JH, Chen CY, Torresi J. Travel health knowledge, attitudes and practices among Australasian travel-ers. J Travel Med. 2004;11:9-15. 10. Hamer DH, Connor BA. Travel health knowledge, attitudes and prac-tices among United States travelers. J Travel Med. 2004;11:23-6. 11. LaRocque RC, Rao SR, Tsibris A, Lawton T, Barry MA, Marano N, et al. Pre-travel health advice-seeking behavior among US interna-tional travelers departing from Boston Logan International Airport. J Travel Med. 2010;17(6):387-91. 12. Cabada MM, Maldonado F, Quispe W, Serrano E, Mozo Karen, Gon-zales E, et al. Pretravel health advice among international travelers visiting Cuzco, Peru. J Travel Med. 2005;12:61-5. 13. Schunk M, Wachinger W, Nothdurft HD. Vaccination status and prophylactic measures of travelers from Germany to subtropical and tropical areas: results of an airport survey. J Travel Med. 2001;8:260-2. 14. Van Genderen PJJ, Van Thiel PPAM, Mulder PGH, Overbosch D. Trends in the knowledge, attitudes and practices of travel risk groups towards prevention of malaria: results from the Dutch Schiphol Air-port Survey 2002 to 2009. Malaria J. 2012;11:179-88. 15. Jacobsen KH, Koopman JS. Declining hepatitis A seroprevalence: a global view and analysis. Epidemiol Infect. 2004;132:1005-22. 16. Askling HH, Rombo L, Andersson Y, Martin S, Ekdahl K. Hepatitis A risk in travelers. J Travel Med. 2009;16:233-8. 17. Van Genderen PJJ, Van Thiel PPAM, Mulder PGH, Overbosch D. Trends in the knowledge, attitudes and practices of travel risk groups towards prevention of Hepatitis A: results from the Dutch Schiphol Airport Survey 2002 to 2009. J Travel Med. 2012;19(1):35-43.